In the summer of 1989, I was 19 and drove with a group of friends from London, Ontario to the famous Pine Knob Theatre in Michigan to see Metallica on the Justice For All tour. It was a very hot day, and there were 5 of us in a compact car with no air conditioning. Even with the windows rolled down for most of the 3 hour drive, all of us were in muscle shirts and sticking to each other in a horrifying, sweltering mess. When we arrived, it was like a big football tailgate party in the parking lot with everyone partying it up before the gates opened. One of our guys got very friendly with a girl in the pickup truck parked beside us, and before we knew it, had run off with her into the bushes. Meanwhile, her big, mean-looking boyfriend came back wondering where she had got to. Some of his friends pointed towards our vehicle, and we actually watched him angrily put on brass knuckles and wait for them to come back. The girl and our friend came back separately, and she must of came up with a good excuse because things cooled down and we could stop worrying that we were going to get into a giant brawl before we even got into the venue. The Cult opened up the show. At one point Ian Astbury seemed to have lost his famous cowboy hat in the crazy crowd. Metallica was amazing, but the one thing I remember most is that the crowd started a giant bonfire in the lawn seats and it just seemed to grow in size as the night went on. Then, hundreds of people started to mosh around the giant fire like some ancient pagan ritual. It was the most insane thing I’ve ever seen at a concert. Whenever I hear Creeping Death, that memorable day as a teenager in the 80’s always comes to mind. 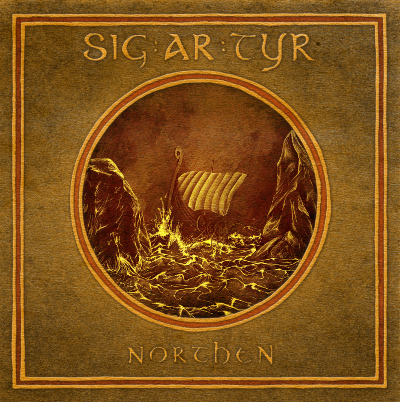 SIG:AR:TYR will release the "Northen" full-length album - the band's first studio release in five years - later this coming Fall, with more details at this location. 0 Comments on "Pit Stories: The Summer Of '89"